The structure of this shape-shifting material is inspired by an origami technique called snapology, and is made from extruded cubes with 24 faces and 36 edges. Packing your house into a backpack or adding a new window to a wall at the flick of a switch has been made possible by a new shape-shifting material. Harvard researchers have designed a new foldable, self-actuated 3-D material that can be continuously controlled and reprogrammed to change size, volume and shape. The study appears today in Nature Communications and offers a glimpse into the material that was inspired by an origami technique called snapology. The material is scalable from the nanoscale to the meter-scale and could be used to make anything from surgical stents to portable pop-up domes for disaster relief. When folded flat, the total volume of the material is reduced by up to 100-fold while still being able to withstand the weight of an elephant before popping right back up ready for the next task. ResearchGate spoke to study’s first author Johannes T.B. Overvelde from Harvard’s School of Engineering and Applied Sciences about the material. ResearchGate: Can you offer a simple explanation of the material? Johannes T.B. Overvelde: The structure is inspired by an origami technique called snapology, and is made from extruded cubes with 24 faces and 36 edges. Like origami, the cube can be folded along its edges to change shape. 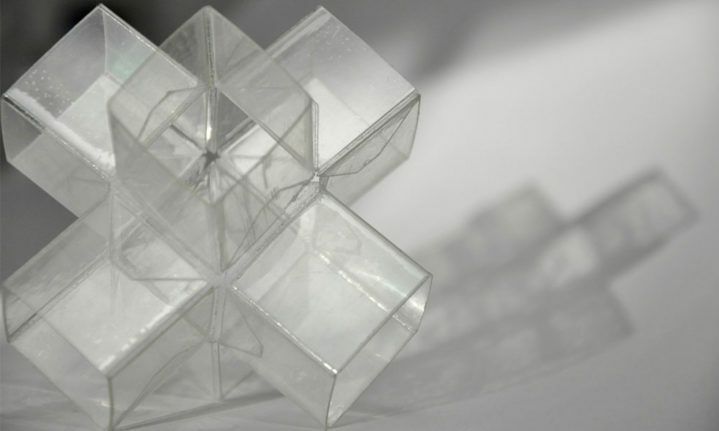 In the article we demonstrate, both theoretically and experimentally with a centimeter-scale prototype, that the cube can be deformed into many different shapes by folding certain edges, which act like hinges. We furthermore embedded pneumatic actuators (air pockets) into the structure, which can be programmed to deform specific hinges, changing the cube’s shapes and size, and removing the need for external force. RG: How do you control the material? How easily could it be shaped and changed in real-time? JO: Through analytical analysis we identified that the structure has exactly three degrees of freedom (i.e. there are three ways in which the structure can deform). By strategically placing and pressurizing the embedded actuators, we were able to control and deform the structure along these three degrees of freedom. The large assembly of extruded cubes (4x4x4) contained a total of 96 actuators, 32 for each degree of freedom, which we pressurized manually using three syringes. The structure responded directly, such that the deformed states could be achieved within a few seconds. Moreover, when releasing the pressure, the energy stored in the elastic hinges immediately pushed the structure back to its initial fully expanded state. RG: What inspired the material’s design? JO: The current work was initially inspired by snapology, a type of modular unit-based origami invented by Heinz Strobl in which paper ribbons are used to create complex geometric extruded polyhedra. While snapology provided the geometric starting point for our research, we focused on the foldability of these structures and how this can lead to new designs for transformable metamaterials. RG: What were the main challenges you had to overcome in its design? JO: Besides the analysis to fully understand the ways in which the extruded cube could change shape and the corresponding actuation strategy, there were also significant experimental challenges. First, we had to come up with a layering and assembling technique that could create a 3D thin-walled structure. An important consideration was the move from paper models (following the snapology technique), to a more robust structure consisting of polymeric sheets that responded elastically. Second, we had to design actuators that were thin, but still be able to apply reasonable force. RG: How heavy is the material? And are there limitations to its potential size or the weight it could support? JO: In its initial state, the prototype presented in the paper is relatively light as it has a porosity of 99%. The structure consisting of 4x4x4 extruded cubes is 36x36x36 cm and weighs about 0.5 kg. However, by folding it flat, the total volume can be reduced by a 100-fold. Moreover, in its flat state the structure could withstand the weight of an elephant without breaking, and pop right back up. While we used polymeric materials to fabricate the structure, our centimeter-scale experiments were mainly to show that such a structure could be built and actuated. In fact, other materials could have been used as well. RG: What excites you most about the design? What applications do you foresee for the material? JO: The design can be used to make foldable and reprogrammable objects of arbitrary architecture, whose shape, volume and stiffness can be dramatically altered and continuously tuned and controlled. Importantly, the structure is completely scalable, it works from the nanoscale to the meter-scale and could be used to make anything from surgical stents to portable pop-up domes for disaster relief. In fact, by using various type of actuation this material can be programmed to interact with its environment in different ways as it changes its shape. If one would make a wall from this material, for example, it could be folded in different ways to manipulate sound or light. Or a roof that on a hot day autonomously opens up its microstructure to allow fresh air to come in, or closes when it starts to rain. RG: Do you have a rough timeline for when the material could be made available? JO: Depending on the characteristic size of the structure, it could already be applied today. For example, this structural system has fascinating implications for dynamic architecture. The main challenges lie in reducing the size of the structure down to the micro or even nanoscale, and to implement a suitable actuation approach at this scale, such as thermal, dielectric or even water-based actuation. This article about Johannes Overvelde’s shape-shifting material was originally written for and published by ResearchGate.